Kurdish authorities estimate that 100,000 people have fled Kirkuk, Iraq, this week, formerly under control of the Kurdistan Regional Government (KRG) but now lost to the Baghdad government and its Iran-backed Shiite militia allies. Kurds fleeing Kirkuk—a multi-ethnic city heavily reliant on its vast oil resources—say Popular Mobilization Forces (PMF) fighters are looting, burning houses down, and attacking Kurdish citizens. The Iraqi government announced a military initiative to wrest Kirkuk out of KRG authority after September 25, when the KRG organized a non-binding referendum asking Kurds whether they would support the establishment of an independent Kurdistan. While Kirkuk has not traditionally been considered a part of Kurdish territory, the Kurdish Peshmerga have controlled the city and its province since 2014, when the Iraqi army fled an Islamic State attack. The Peshmerga prevented ISIS from taking over the city, and its oil supply, and incorporated it into the KRG. Unable to trust its own military, Baghdad eventually incorporated the more militarily adept PMF into its armed forces. The PMF have received military backing from both the United States and Iran and appear loyal to the government in Tehran, not Baghdad. The Peshmerga also claim to have evidence that Iran’s Quds Force terror brigade, a wing of the Iranian Islamic Revolutionary Guard Cords (IRGC), are fighting against them in Kirkuk. Reports have placed Maj. Gen. Qasem Soleimani, the head of the Quds Force, in Iraq supporting the PMF. 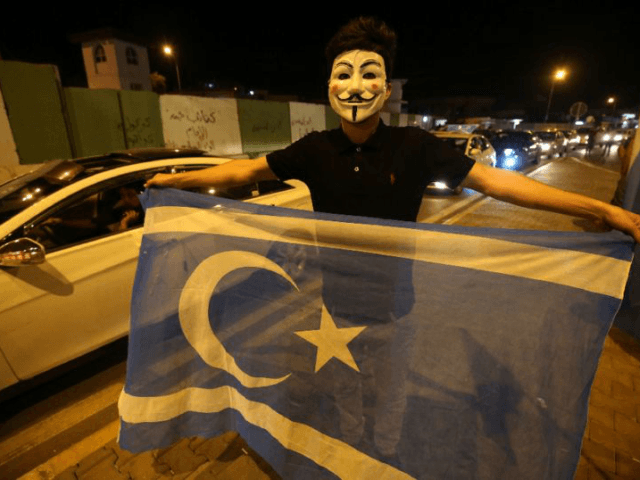 Governor Nawzad Hadi of Erbil, the capital of Iraqi Kurdistan, estimated to reporters on Thursday that 100,000 people had fled Kirkuk and 18,000 families had entered the Erbil area and relocated to refugee camps. The number shows a significant spike in the number of displaced people between Thursday and Tuesday, when the United Nations issued a statement estimating that 61,000 people had fled Kirkuk. In addition, Kurdish authorities warned that another 57,000 families needed “immediate assistance” in Erbil, Sulaimaniyah, and Duhok, all in KRG territory. Baghdad, which is responsible for the displacement, also confirmed major operations of “forced displacement” in through its Iraqi Ministry of Displacement and Migration. The ministry is urging Kurds to stop fleeing Kirkuk and other areas occupied nominally by the Iraqi government and more realistically by the Iran-backed PMF, according to a statement on its Facebook page. Those who have fled tell reporters they fear a genocide campaign by Shiite Arab forces. “They came to our homes and burned things,” one older woman tells Al Jazeera on her way out of Kirkuk. The U.N. noted that reports also suggested attacks on ethnic Turkmen locals, not just Kurds. The outlet Kurdistan24 reports that some of the displaced have used social media to warn of “another Anfal campaign (Kurdish genocide)” and includes among those warning the invasion intends to ethnically cleanse the region of Kurds the vice president of the KRG, for whom Baghdad has issued an arrest warrant. The government of Turkey, which has supported Baghdad’s invasion of the KRG, appeared to lend credence to this fear this week, suggesting that Baghdad had a responsibility to encourage the reversal of “demographic change” that allegedly occurred under the KRG. “We expect from the central government to show the necessary sensitivity in reversing the demographic changes implemented by the Regional Administration of Northern Iraq in the areas it captured from the Peshmerga, including Kirkuk,” Prime Minister Binali Yildirim said this week.